BROADVIEW, IL. July 21, 2015 – A daring pass by Kyle Busch late in the race took his Bosch-equipped No. 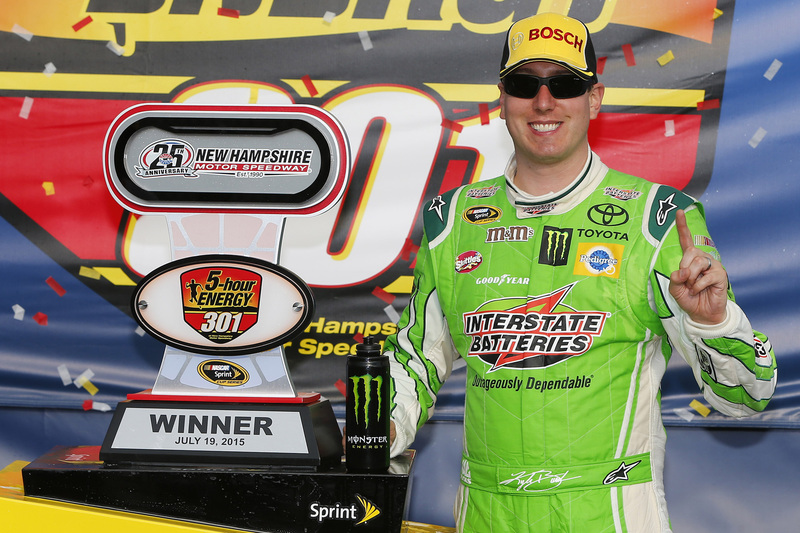 18 Interstate Batteries Toyota to Victory Lane in Sunday’s NASCAR® Sprint Cup SeriesTM Race in New Hampshire — the third win in his last four races. In recognition of the victory, Bosch Aftermarket NA is making another $1,000 contribution to the Kyle Busch Foundation. Thus far in the 2015 NASCAR Sprint Cup Series season, Bosch-supported teams have won fifteen out of nineteen races, for a total of $15,000 contributed to help carry out the missions of team charities. The Kyle Busch Foundation works to empower children, families and communities to overcome hardships, allowing them to live their best lives possible. The Foundation concentrates its efforts on assisting organizations in fostering a stable and inspiring environment for children, families and communities to live, learn and challenge themselves as well as ensuring day-to-day needs are met. The Foundation supports the following charities: A Child’s Place, Barium Springs, Church of God’s Children Home of North Carolina, Girl Talk Foundation, Isabella Santos Foundation, Kyle & Samantha Busch Bundle of Joy Fund, My Sister’s House, Pretty in Pink Foundation and Speedway Children’s Charities. Bosch Aftermarket has a long-standing partnership with NASCAR, providing oxygen sensors to all NASCAR Sprint Cup Series teams. Additionally, Bosch has provided quality parts — including spark plugs, injectors, alternators, coils, filters, fuel pumps, starters and pressure regulators — to multiple NASCAR teams for more than a decade, helping them to numerous appearances in Victory Lane and seven Sprint Cup Series championships since 2001. Having established a regional presence in 1906 in North America, the Bosch Group employs some 28,700 associates in more than 100 locations, as of April 1, 2015. In 2014, Bosch generated consolidated sales of $11.3 billion in the U.S., Canada and Mexico. For more information, visit www.boschusa.com, www.bosch.com.mx and www.bosch.ca. Additional information is available online at www.bosch.com, www.bosch-press.com, and http://twitter.com/BoschPresse. For more information on Bosch Automotive Products, visit www.boschautoparts.com. *The sales figure disclosed for 2014 does not include the former joint ventures BSH Bosch und Siemens Hausgeräte GmbH (now BSH Hausgeräte GmbH) and ZF Lenksysteme GmbH (now Robert Bosch Automotive Steering GmbH), which have since been fully acquired.